The Radio, Sound & Society journal is an open access scientific journal edited by the ECREA Radio Research Section. It is a bi-annual publication, aimed at publishing relevant research (fundamental and applied research outputs) in the field of radio and sound. The journal welcomes contributions regarding challenges radio faces in the web environment, acoustic language, audio media in general and sound art. Areas of interest include radio history, radio business model, technology, narratives and programming, audiences, advertising, music industry, web radio, sound art, public service broadcasting, aesthetics and sound, sound and literacy. Empedocles aims to provide a publication and discussion platform for those working at the interface of philosophy and the study of communication, in all its aspects. 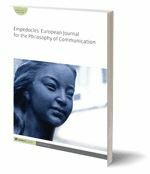 This Journal is published by Intellect in cooperation with the ECREA Philosophy of Communication Section.